Owning a dog can be a rewarding experience; they can be great companions, they will get you out of the house and help you stay in shape when you take them on walks, they can help us to relieve stress, are known to be positive mood boosters, and they are beneficial for our kids. However, if you don’t train your puppy correctly or you don’t correct any bad behavior traits then you will not get any of the above-mentioned benefits. Instead, your pet will become a nightmare and a burden…maybe even a danger if they are aggressive. Professional Dog Trainer or Learn How to Train Your Dog Yourself? So, it is vital that you learn how to train your puppy the moment you get it back to your home. Of course, with the right resources…like Dog Training by Dove Cresswell… training your puppy yourself is one option, or you could hire a professional dog trainer. In my opinion, it is better to learn about dog training yourself. Apart from the fact that you will save hundreds of dollars, you will get better long term results by training your dog yourself. You see, a dog trainer will train your dog but once they are done, you will probably un-train it. It is necessary to train you…the owner… as well. Obedience training should quickly teach your dog to respond to specific, well-delivered commands. 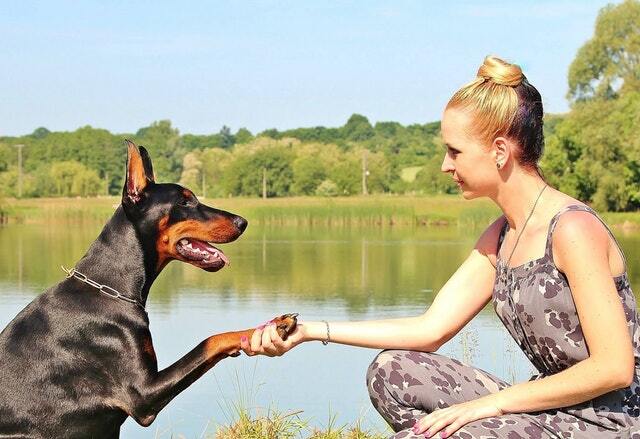 This means that you will learn how to give those commands; dog training is a two-way street. Leadership – Often called Alpha Dog Training…you would learn how to assert your dominance over the dog. This is to demonstrate to them that you are in charge and that they must listen to and obey you at all times. Alpha leadership is the cornerstone of all good dog training. Basic Commands – This part of training your dog will provide you with basic commands like sit, stay, down, come, and heel. These commands will make your dog more respondent when it matters; in fact, these five commands will form the foundation for everything you need to teach them in the future…like tricks for example. Walking – You have probably seen people in the street or the park being pulled along by their dog. This is because those dogs have not been leash trained properly, especially the alpha leadership part. You must learn how to control your dog’s movements when walking them. The first and most important command to learn is the heel command. It is vital that your dog learns to follow you by your side to keep them from running around on you, chasing other dogs, or running out onto the road. The above training video on how to teach your dog to walk to heel uses gentle methods which have no need for tools, gadgets, or demands. Dog obedience training is important as it provides the foundation for all the issues that could arise in the home. Remember that your dog will only do what it is taught to do. You need to be consistent, effective at maintaining the commands you give, show your dog that you’re always in charge, and ensure that everyone in the household also follows along with everything you’ve taught your dog in training. Remember that a dog simply reacts to you. It wants to be accepted and be a part of the pack, but it’s still an animal with animal instincts. So, if you want to correct any negative behaviors, the best way to approach training your dog is not to yell at them or scold them, but to focus on changing how they express those instincts. Good dog training can, in fact, be harder for you than your dog, but it is always well worth it. The best resource that I know of for dog behavioral problems is Secrets to Dog Training. We will be covering these behavioral problems and obedience training techniques, including how to crate train a dog and clicker dog training, in the articles on this website. Many times, you can deal with your dog’s minor health problems yourself…before they become major issues. Although there’s no substitute for reliable attention from your vet, you can prepare yourself by doing everyday things that can prevent many dog health problems. For more information on dealing with dog health issues, check out The Ultimate Guide to Dog Health.